Congratulations to our Client Elephants On The Wall for their feature in Bay State Parent Magazine! 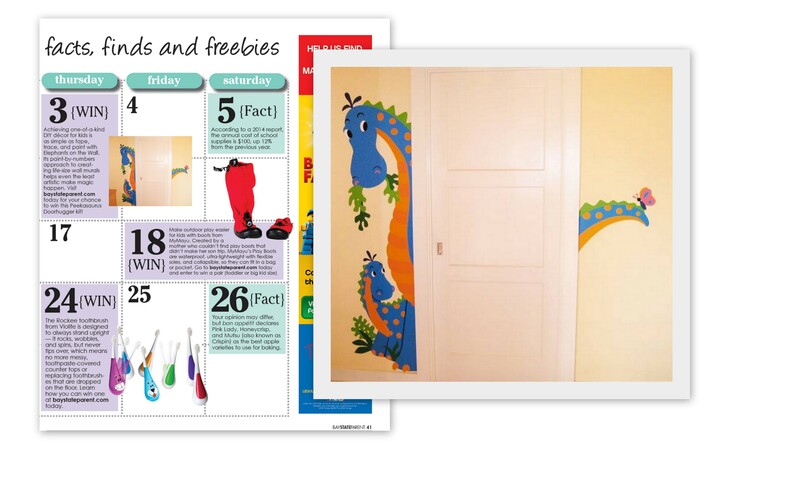 Elephants On The Wall can addÂ whimsy and delight to any child’s room with their easy Paint-by-Number murals. Just TAPE, TRACE & PAINT. Finally a DIY project you can be proud of. It’s perfect even for the “Artistically Challenged”. Get professional results at amateur prices. Over 150 designs available – from jungle, beach, fairies, construction, pirates, silhouettes and more. Each kit comes with the full-sized paper pattern, transfer paper, directions and a color guide. Patti Newton is the owner of Elephants on the Wall and former designer for Walt Disney Imagineering where she designed themed graphics & signage. Her designs have been seen all around the world and now she has dedicated her artistic skills to creating beautiful murals for all to enjoy. Check them out at elephantsonthewall.com!